Greg has 20 years’ experience of working as a therapist. His original training was as a Dramatherapist at the Central School of Speech and Drama (Post grad Diploma) which is a Jungian based training. 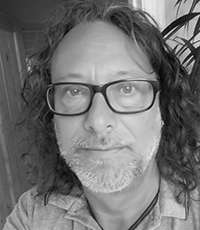 He has added a variety of further training including energy based practices such as EFT and Reiki as well as various creative trainings such as playback theatre. Greg has recently taken part in a training on working with boys and young men with mental health issues. He is a member of HCPC and the British Association of Dramatherapists. Greg has had eight years’ experience of working in secondary schools as a therapist. He has worked extensively with adults and teenagers with issue of stress, anxiety, self-esteem and identity issues as well as relationship and work-related issues. He has also run a variety of workshops within the LGBTQ community exploring identity and developing self-esteem. Previous work has included working with the elderly and people with dementia, young adults with autism, adults with complex needs, and physical and learning disabilities. Greg likes to invite his clients to make their own choice as to how they would like to work with him. From traditional talking therapy to exploring creative approaches. The most important element being that the client feels comfortable and safe. The building of trust is the essential foundation for a good therapeutic relationship Greg will only suggest moving onto more creative ways of working if the client feels comfortable to do so. There is no expectation of experience, just a willingness to have a go. ‘Creativity gives us the chance to take a step back and view things from a different angle’. Creativity can provide a safety net for the client by working on issues less directly through images or objects or story. By offering the client choices such as using art materials, objects or drama based techniques such as embodiment, movement, story making and role play. Therapy is not a miracle cure, but requires a commitment to engage, to challenge our own set of responses and beliefs. My commitment in return is to ensure anyone who comes to me for therapy feels safe and comfortable to be able to explore and benefit. Greg previously worked as a manager of a Therapy department in the NHS, a Marketing manager for American Express, a budget manager for social services and various employment in the Theatre. Monday morning & evening at Palmeira Square.